In March, 2018, my car developed an engine knocking noise. My mechanic advised me to take the car to the deal-er as it was an internal engine noise and to check recall notices. I found the recall notice and went to the dealer. They had the car inspected and I was approved for a new engine. I had to take the car back because they did not properly tighten the heat shield. In August, 2018, on or about the 24th, the car was difficult to start. The engine would turn over, but not start right away. I promised my wife that I would take the car in on Monday, the 27th, but we did not have that opportunity because the car caught on fire totally destroying the car. 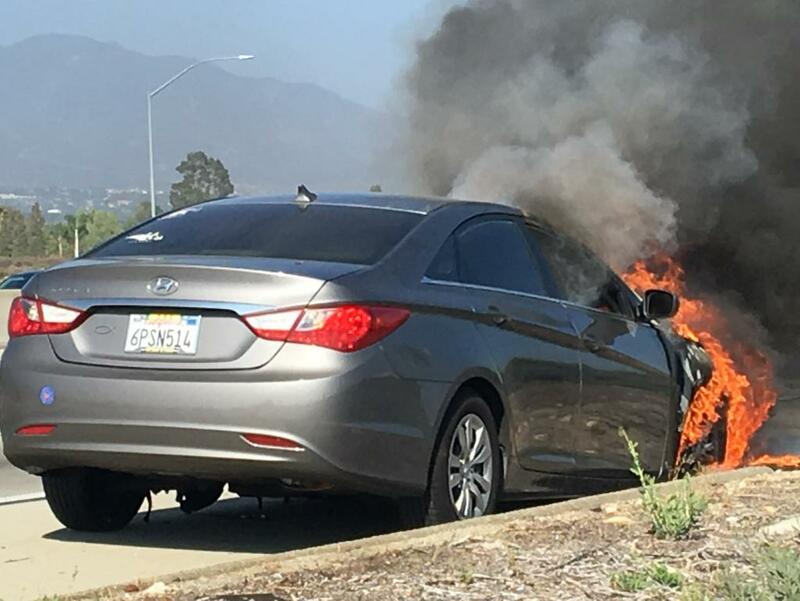 We were on our way home on the eastbound 210 freeway at the Campus Ave. exit when the car lost power and the gas pedal would not work. I had been in the number 2 lane and as I told my wife that something was wrong with the car there was a very sudden hard jolt to the car. I then tried to downshift but the transmission lever went to Park without a problem nor did it work. I got to the shoulder of the freeway and the brakes weren't working so I let the wheels drag along the asphalt curb until I pressed on the emergency brake and shut the engine off. By then smoke was filling the car coming through the air vents. As my wife and I opened the car doors to escape we found that we had been followed by a AAA tow truck with its emergency lights on blocking the slow lane so that we could get out. If we had had our grandkids with us, I don't know if we could have made it as they would have been in baby car seats in the back. I have as yet not contacted Hyundai, as I have been discussing this with a law firm.